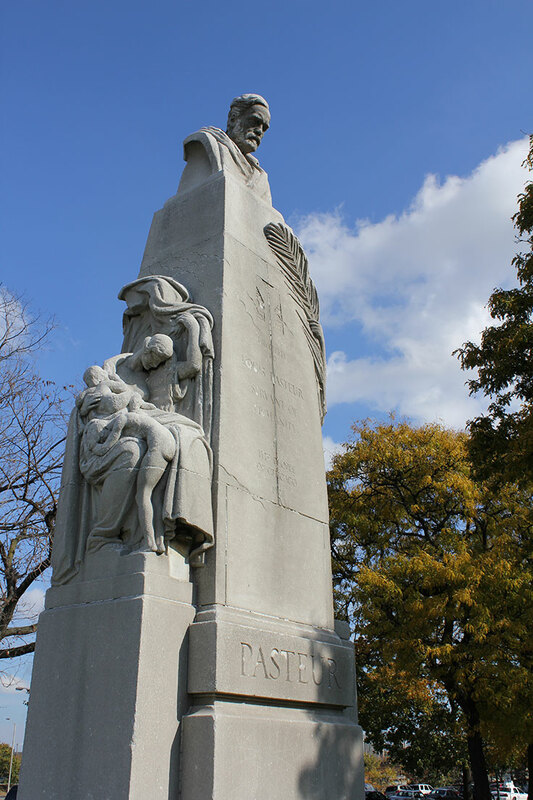 June 10, 1946 – A monument to Louis Pasteur, originally dedicated in a 1928 Grant Park ceremony, is rededicated at a new site in a park near Cook County Hospital at 1800 West Harrison Street. Dr. R. B. Allen, the Dean of the University of Illinois Chicago colleges in the medical district, makes the presentation with the principal address given by Dr. Edwin P. Jordan, the Associate Editor of the Journal of the American Medical Association. The monument is officially handed over to Cook County during the ceremony, and the president of the Cook County Board, Clayton F. Smith, makes the acceptance speech. The monument was originally erected as a result of a collaboration of civic leaders in 1926, led by Dr. Frank Billings, who had studied under Pasteur. The park just to the north of the old Cook County Hospital is an appropriate setting for the county’s monument; its creator, Leon Hermant, who was awarded the French Légion d’honneur for the work, was also responsible for much of the architectural sculpture on the Cook County building on Clark Street between Washington Boulevard and Randolph Street. On the rear of the sculpture’s base, a bronze plaque reads, “One doesn’t ask of one who suffers: What is your country and what is your religion? One merely says, You suffer. This is enough for me. You belong to me and I shall help you. – Louis Pasteur” When the sculpture was dedicated on October 27, 1928 the ceremony was so important that United States Vice-President Charles Dawes and the French Ambassador to the United States Paul Claudel. were present. You would not guess that today, as the monument sits largely ignored and deteriorating in a small plot of green space, surrounded by expressway noise and sirens, with a helicopter landing pad between it and the old hospital. 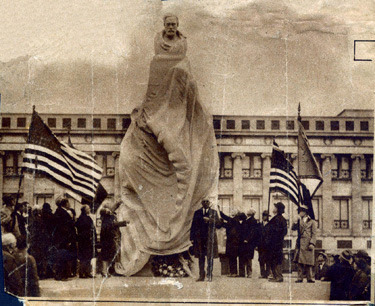 The top photo shows the statue at its dedication just west of the Field Museum in 1926. The photo below that shows the monument as it exists today. 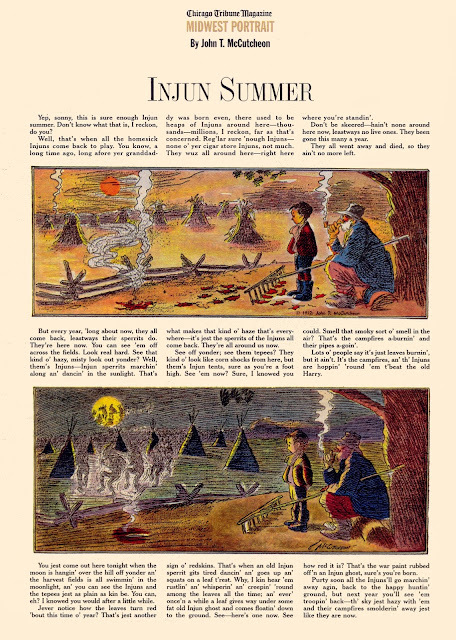 June 10, 1949 – John T. McCutcheon, 79, a cartoonist for the Chicago Tribune, dies at his home at 1272 Green Bay Road in Lake Forest. McCutcheon began his career as a newspaper artist at the Chicago Record, later the Chicago Morning News, in 1889. He worked in various iterations of that paper until he moved to the Chicago Daily Tribune in 1903. The Online Comics Journal summarizes the jobs of newspaper artists such as McCutcheon at the turn of the century in this way, “Newspaper artists furnished all the illustrative material for the papers of the day. The halftone engraving process for reproducing photographs had been perfected in 1886, but it was not adapted successfully to the big rotary presses until the New York Tribune did it in 1897. Until the turn of the century, newspaper sketch artists were graphic reporters, covering all the events that photographers were to cover later. McCutcheon drew pictures of everything. He illustrated major news events, often working from sketches made on-the-spot. A typical day might include a trial in the morning, a sporting event or crime scene or a local catastrophe in the afternoon, and an art show opening or a flood or fire in the evening … he was more illustrator than cartoonist, and he also wrote occasional feature pieces and newsstories [sic].” Without a doubt the most famous of the thousands and thousands of illustrations and cartoons that McCutcheon produced is “Injun Summer,” first published on September 20, 1907, in which a small boy and an older gentleman look over an Indiana corn field as shocks of corn turn into an Indian campground. June 10, 1923 – The Chicago Tribune prints the following announcement, “On this June morning, which brings its diamond jubilee day, The Chicago Tribune takes the first step toward the creation of a monument which shall commemorate three-quarters of a century of achievement and shall be to this community and this newspaper an inspiration for the future.” [Chicago Tribune, June 10, 1943] With prizes totaling $100,000 the paper opens “to the architects of all countries’ an opportunity to design “the most beautiful building in the modern world” to be constructed on North Michigan Avenue just west of the paper’s existing printing plant. For a reasonably concise explanation of the competition and how it came out, you can head to this entry in Connecting the Windy City. 1. The erection of a structure of enduring beauty which shall be at once a glory to journalism and to the city, and a model of practicality. 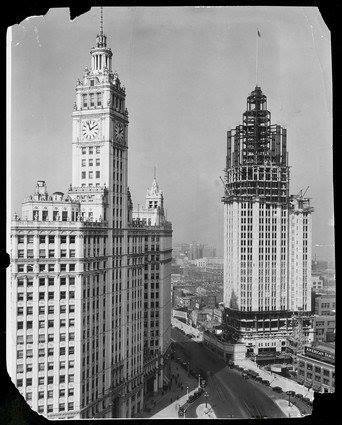 The Tribune seeks, in short, artistic nobility and business effectiveness. 2. The providing of new quarters for the rapidly extending demands of a newspaper which, though it looks back this morning on 75 fruitful years, lives in an unparalleled present. 3. The offering of financial encouragement so emphatic and so prompt that it will give fresh impetus to the great cause of commercial architecture in America. Whether this encouragement will discover and develop new talent, or give added recognition to men whose fame is already established, the result of this competition will show. 4. The addition to the assured architectural splendors of the new North Michigan boulevard of a building which will give the tone and tendency to a thoroughfare that soon will be the most impressive street in the western world.